‘Mr Nicholson... I received your order for 10 shillings with thanks. How is the little, as he sailed is boat yet. I suppose you have a pool with you near by. If he is like I was always for boats’. 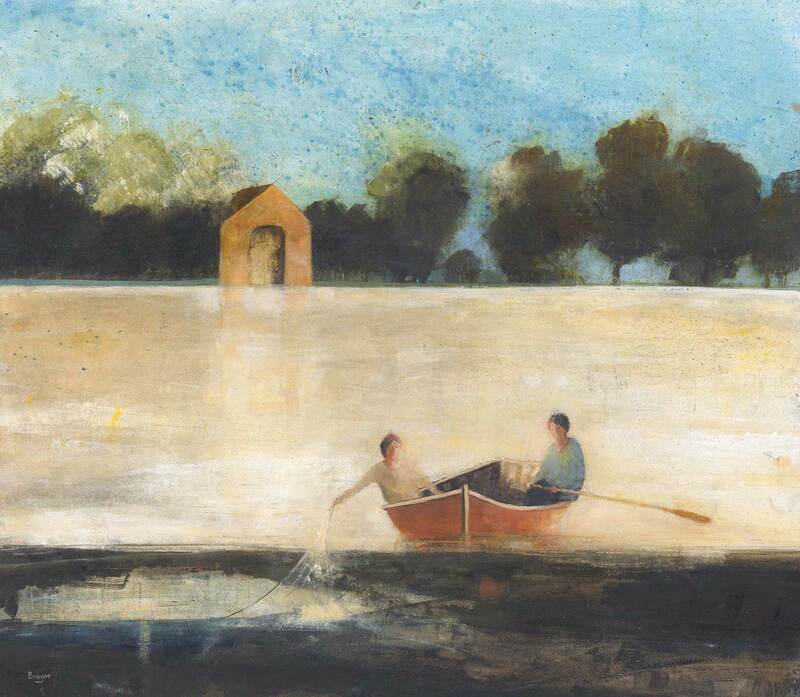 While Cornish sailor and artist Alfred Wallis spent years toiling at sea and in retirement painted from his memory ‘what belonged to be’, David Brayne grew up in Boston, in that strange and unique landscape of the Wash, where the land, water and sky seem virtually indistinguishable. It certainly left a profound mark on his visual imagination. Later, he found himself living near the Somerset Levels, another singular, flat landscape where water plays a prominent role. It’s interesting that David studied Philosophy and Art. His work offers aesthetic and intellectual interpretation. “Boats are perfect for containing the figures – they act like ‘space cages,’ holding the figures together; the fishing rods or nets link them both physically and metaphorically to each other and to the water,” he explains. The mysterious characters are inspired by people he knows but are left sufficiently indistinguishable, as if in a dream, so the viewer chooses what to see and may conjure a narrative of their own. David’s paintings may be tender and ambiguous. A solitary figure within a vast landscape appears fragile, yet we see a strength in the simplicity of the composition and boldness in his lines, creating geometric shapes in the hull of a boat, for example, or in the curve of a hill. While dark cliffs, rocky features, or a table and sofa in an interior give anchorage and a place for the figures to rest. Sometimes they merge with shadows while at other times they float on the surface. A painting starts as a soft sketch, before the underpainting and the application of his favoured pigments, mixed with a water resoluble acrylic binder. Here lies the unique quality of David’s resonant, richly textured work. The final piece takes many sessions as he washes away layers and reapplies colour, harmonising, building shifting, chalky swathes of water, sky and land. 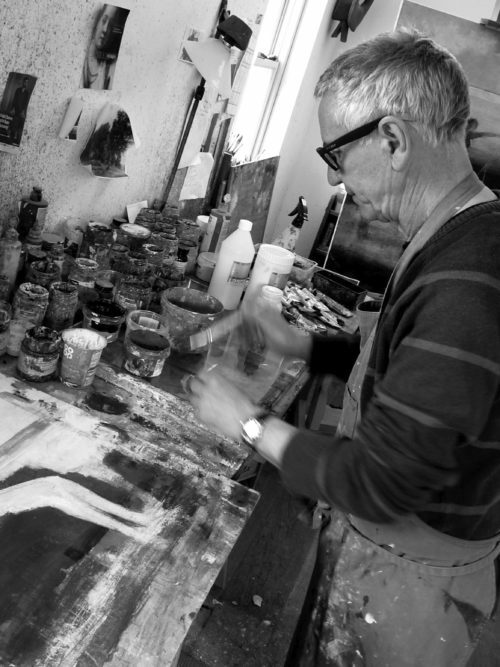 His distinctive use of paint has won plaudits and awards in the UK, especially at Bankside at the Royal Watercolour Society, and abroad, recently China, India and the US. David’s style has a dreamlike blend of the past and contemporary, as interiors and still lifes conjure ideas of Bloomsbury drawing rooms while fisherwomen and boats appear as though they may have been standing, waiting for centuries. It’s not what Wallis had in mind, but within their ethereal and meditative world, all is just “what belonged to be”.